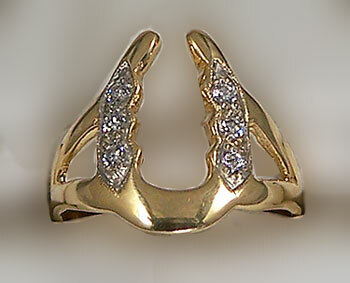 Horseshoe ring with diamonds great for the horse lover in your family. Here we set diamonds in a long gaited horseshoe ring. Perfect for the horse owners style of living. Diamonds are set down in the metal for a smooth finish that eliminates snagging and makes for a comfortable ring. Dimensions: 18mm wide at the top of the ring tapering down to a 3.5mm shank on the bottm of the ring. Horseshoe ring is set with .28ct of matching full cut round diamonds. Would you like to design your own? Now you can! Request what you would like to have custom made below in our special request box below. Our experienced jewelers are ready to serve you!